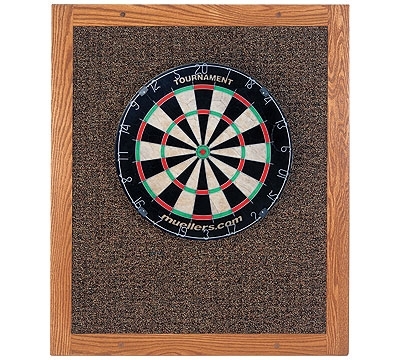 Our dartboard backboard is made specifically for protecting your walls from oncoming darts. It also helps keep your darts from dulling. You'll have a hard time finding any other backboard that comes close to our solid construction. The solid oak hardwood frame measures a generous 2-1/4" wide and 7/8" thick with three-layer construction. Each corner is made with a stile and rail glue joint and two 3/8" x 3" dowels. The carpeted surface is very forgiving, as its 5/16" fibers make it practically impossible to see where the darts have missed the dartboard. Backboard comes ready to hang, with four holes and screws. Also includes a bracket for hanging dartboard. Overall measurements of the backboard are 30 1/4"W x 36 1/4"H.
Extra freight charges will apply when ordering backboard(s). Mueller Recreational Products guarantees this product for 5 years against material or manufacturer's defect. When buying 3 or more backboards, call 800-627-8888 for additional discounts.